Starline Track Busway, the 40, 50 & 60 amp compact series offers a reliable, easy to install overhead power distribution system for your lighting, or any other light duty power draw needs. No extra grid hanging support is needed since Starline Track Busway incorporates the grid in its housing structure. 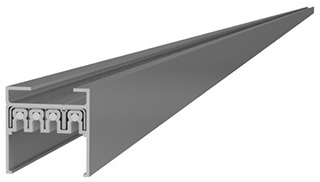 The Busway consists of extruded aluminum housing and an insulated strip that contains copper conductors which are mounted on the top interior wall. What’s unique about all Starline Track Busway systems is that each section has an open access slot over its entire length for the insertion of plug-in units. The aluminum housing is a 100% ground path during normal operation. To build a layout, housing sections are easily connected together using snap-in, in-line connectors and plate type housing couplers. Elbow, tee and crossover connector sections make it possible to achieve virtually any layout configuration. Plus, there is no need for unistrut. The Busway system would not work without the use of a Power Feed Unit. 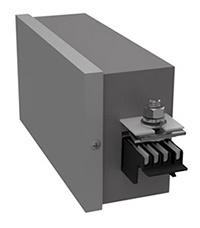 This consists of a steel junction box with a removable side, a connector to insert into the Busway run and a terminal block for field connections. Bolt the end power feed to the first Busway section and you’re ready to connect a power source to distribute power throughout the system. A popular choice to tap off power from the 40, 50 & 60 compact series is an outlet plug-in unit. All plug-in units are equipped with a special plug head that ‘snaps’ into the busway continuous slot to make a spring-loaded connection. These plug-in units work perfectly for supplying power to small industrial applications, or equipment such as cash registers in a retail environment. In addition to its reliability, what makes the Starline Track Busway Compact Series so appealing is its flexibility. The continuous power access slot gives users the ability to draw power from wherever they need it; presenting them with the capability to change a work or display layout within minutes, with no expensive rewiring required.